The XF 100-400mm f/4.5-5.6 R LM OIS WR has a bunch of letters in its name, and while it may be a mouthful to say (and write), the letters are consistent across the Fuji lineup. In this case, the alphabet at the end of the lens name lets us know that the 100-400mm has an aperture ring, a linear focus motor, optical image stabilization and weather resistance. The 100-400mm’s external construction is predominantly high-grade plastic, presumably to keep weight down, with a metal tripod collar. The lens is tightly assembled and relatively well constructed, though it feels less premium in build than the 50-140mm f/2.8. If you own the Fuji 55-200mm lens, the 100-400mm feels very similar in construction. I’m grateful for the lower weight, but the use of plastics has one detriment: the lens flexes a bit in the tripod collar, even when it’s tightened down, such that there’s a bit of droop after locking down the tripod head. I have a very sturdy tripod head (Really Right Stuff BH-40) and the head isn’t moving after lock down: it is visible that the lens itself is moving slightly inside the tripod ring, which is a bit of a disappointment. 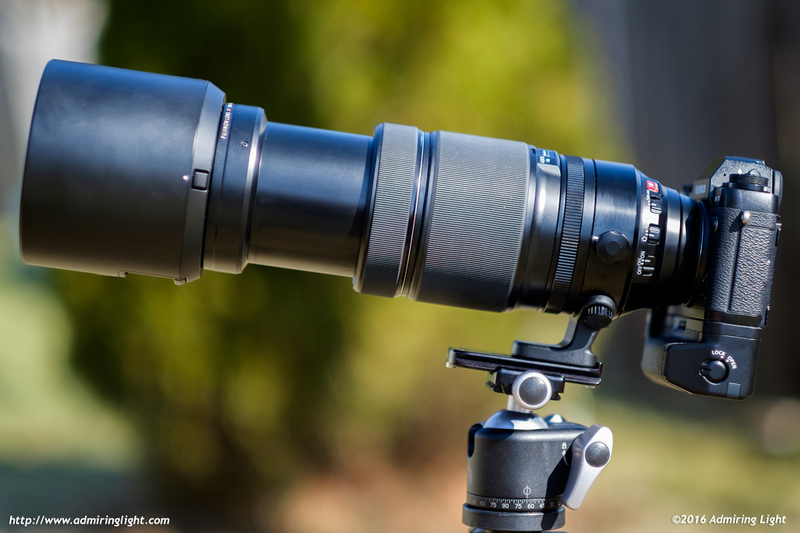 The XF 100-400mm f/4.5-5.6 at 100mm. I will say that the tripod ring moves very smoothly in operation, though I wish the locking knob was a bit larger. The ring can’t be removed, but the foot that attaches to the ring can, using two thumb screws to attach and detach the tripod foot. Thankfully, the foot is far forward on this lens, and unlike the XF 50-140mm f/2.8, doesn’t interfere with the vertical grip on the X-T1. The lens comes with a very large lens hood that locks in place smoothly (and has a hood locking button to release). Fuji again provided a nice window in the hood to allow for the operation of polarizing filters while the hood is in place, but replaced the removable window cover with a convenient sliding mechanism. Clever! The 100-400mm is the largest Fuji lens yet for the X-Series, as might be expected. There’s really no free size reduction for mirrorless lenses once you get into the telephoto focal lengths and the same goes for creating an APS-C image circle, so the 100-400mm is similar in size to most manufacturer’s lenses that cover a similar focal range and aperture range. The lens is about 1.5 inches longer than the Fuji 50-140mm f/2.8, but is notably larger in diameter. Despite the size, Fuji has managed to keep the weight down fairly well. The lens is lighter than I expected; it’s around a half pound lighter than the similarly sized Canon 100-400mm f/4-5.6L II, though it’s certainly not light in an absolute sense at 3 lbs. 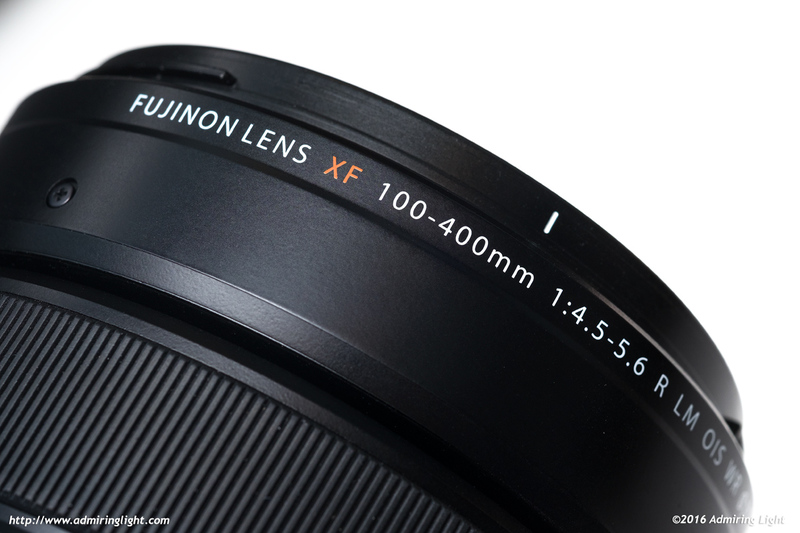 The XF 100-400mm is easily the largest lens for the Fuji X-Series. 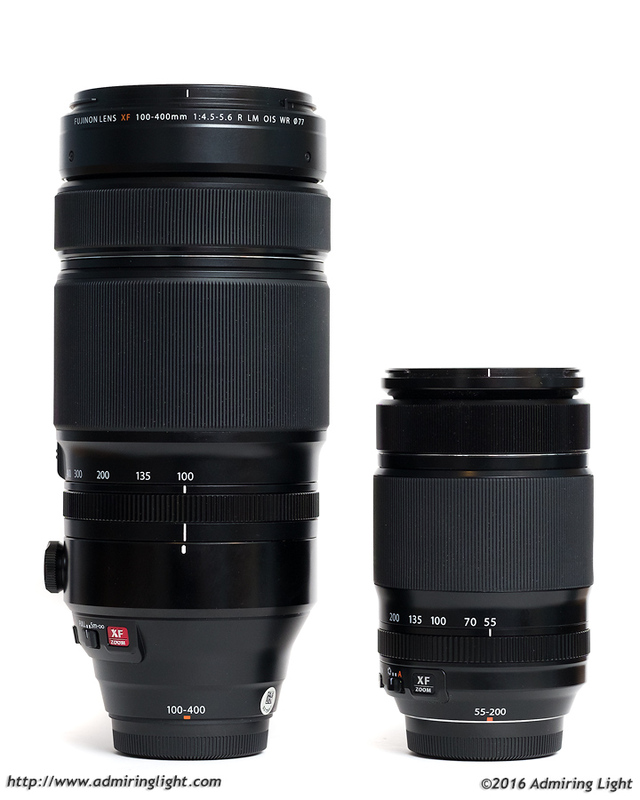 The XF 55-200mm f/3.5-4.8 is set for scale. The lens handles well in the field, though I would recommend using the larger Fuji bodies on the lens. I shot most of the time with my X-T1 with the vertical battery grip to give some extra support. The vertical shutter release also helped with handling a lens of this size. The zoom and focus rings both move smoothly and are well damped, though I felt the zoom action, while smooth, was a bit too stiff for my liking. There’s a lens lock to keep the lens closed at 100mm, but I didn’t find it necessary, as zoom creep just wasn’t happening with this lens. The aperture ring moves with very distinct clicks, though the feel is a bit different on this one than the other Fuji rings. It feels as if the spring-loaded detent bearing is a large plastic bearing rather than the small metal bearings used in the other aperture rings, but in any case it’s fine in use. The lens extends rather considerably when zooming from 100mm to 400mm, bringing the total length with the hood in place at 400mm to around 13.7″. The inner lens tube shows no flex or wobble when at full extension. While I have a few issues with the operation of the lens, it’s a well put together package. The real issue is simply finding a way to put it in your bag. With the relatively small size of the other Fuji lenses, the 100-400mm makes it tough to carry in any bag you may have for your kit. Indeed, I didn’t have a single bag that the lens could be carried in with the exception of a giant shoulder bag that I received as part of the press package from PhotoPlus this year. The 100-400mm f/4.5-5.6 has a similar linear focus motor to the other Fuji zoom lenses, and this has been proven to be fairly quick and quiet. Due to the precision required at 400mm, the focus motor can take quite a while to lock if you need to change focus distance from very near to very far or vice-versa, though once you are in the proximity of your subject, focus locks rather quickly. Fuji provides a focus limiter for the 100-400mm, which can be enabled to limit focus to 5m to infinity for times you want increased focus speed and don’t need to focus up close. Indoors, focus speed also slows down a fair bit, which is to be expected given the relatively modest f/5.6 aperture at the long end. However, I found focus accuracy to be excellent during my time with the lens. 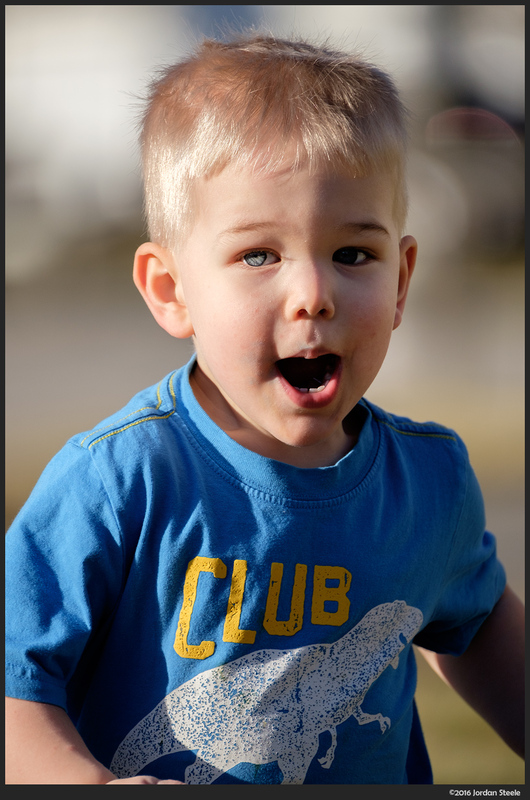 When testing the lens in continuous autofocus, I was able to achieve a fairly reasonable hit level with my son running towards me, even given the long focal length and his relatively close proximity. I still wouldn’t choose Fuji for pro-grade sports at this point in time, but this lens can be used with the more recent bodies for some good action shooting if need be. Just don’t expect to get every shot in perfect focus. See the shot below for an image I was able to grab out of the run. The 100-400mm also features Fuji’s latest optical image stabilizer. Fuji’s been killing it with their OIS on their past few zoom lenses, and they’ve set a new bar with the stabilizer on the 100-400mm. Fuji claims this will offer handholding around 5 stops better than without the stabilizer. With my normal technique, I need approximately 1/800s to get sharp shots at a 600mm equivalent focal length. With the Fuji at 400mm, I’m quite easily getting 5 stops of stability (1/25s) very consistently, and around half of my shots at 1/15s and 1/10s are sharp. That’s 50% effectiveness at 6 stops slower than I can handhold without stabilization. It’s so good that I even managed to get a small handful of shots, such as the quick grab below, at an astounding 1/5s handheld: over 7 stops slower than I can normally handhold a lens of this length. It’s simply astounding. Needless to say the stabilizer comes in very handy with this lens, and the ability to shoot at 1/25s or 1/50s and just KNOW that the shot will be sharp is a great comfort. It’s a truly impressive stabilizer and probably the best I’ve ever used. This is a beautiful review, thanks for taking the time to make it, are you planning on testing the X-PRO 2? and if so could you include some focus thoughts with varying lenses such as this one? I won’t have this lens when my XPro 2 sample gets here, but I will test with many lenses. 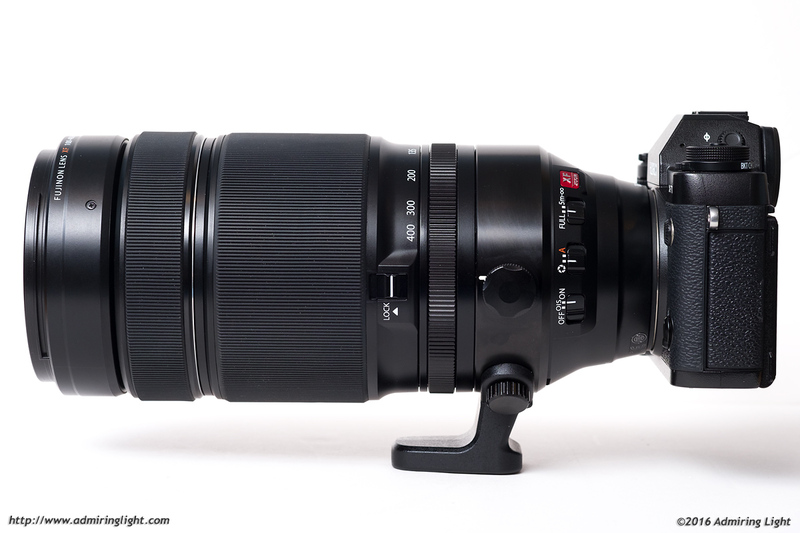 This is an excellent review of this lens plus excellent images to support it. Well done! Keep the reviews coming Jordan. Another excellent review Jordan. I think that your reviews are well balanced, fair, and informative. None of the fan boy gushing that makes me question the objectivity of some reviewers. Since I have the 100-400 on preorder, l am REALLY looking forward to getting it now! Thanks for the review Jordan. Very nice pictures, too. Is there a way to see the images in full size (i.e., 100%)? The few 100% photos taken at 400mm, that I’ve seen, look pretty soft when zoomed in. I don’t generally share full size samples of my work, as I sometimes sell prints or other usage from time to time. I tried my hand at BIF with this lens, but I have very little practice. It did OK, but often, if I couldn’t get the bird perfectly in frame right away, it would try to rack through the whole focus range, which can take a few seconds even with the focus limiter set, so you’ll want to be prefix used close to where the bird is, then it’s up to your skill. At longer distances there’s a bit of softness wide open, but it sharpens up a fair bit by f/8. Unfortunately, I didn’t get to test at night, aside from a handful of terrible throwaway snaps. I can tell you that flare isn’t an issue with streetlights and that bokeh looks as smooth with lights in the background as it does with other detail. No visible onion rings, which is to be expected given that the lens doesn’t use aspherical elements. 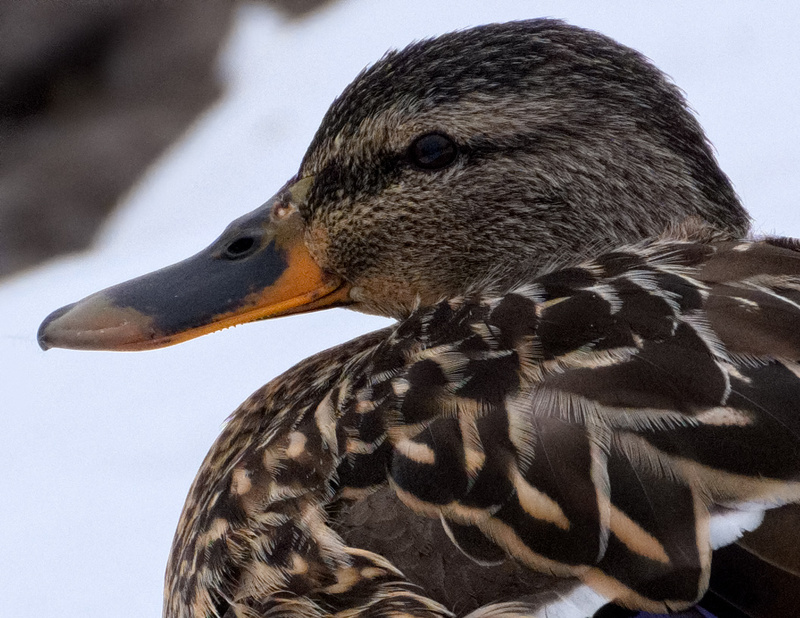 I have no experience with Long Range Telezooms, but I was able to hold 1/8s at 400mm f5.6 and it was sharp. A more experienced Photographer could hold a longer shutter time … maybe. I was standing, the Lens laying on my elbow. Nothing more. The OIS is great! Ups … I was too fast by scrolling down 😀 I’ve just seen that you also were able to hold much slower shutter times than 1/25s. I’m really impressed by Fujis OIS! There is one thing I would like to know because I didn’t try … how many focus points are usable at 400mm? All of them or just a few in the middle? All of them are usable (in good light), though in dim light or for fastest speed, the PDAF points in the central area will focus faster and more surely. Excellent review Jordan. Which tripod do you use? I use an Induro CX-213 (the current equivalent model is the CT-213) with. Really Right Stuff BH-40 ball head. Jordan, another excellent review which I enjoyed reading very much. I have this lens pre-ordered including the TC 1.4, to use on birding tours, such as the New Mexico sanctuary, could you comment on how that might impact sharpness ? On tripod shots did you have OIS turned off or leaving it on ? Thanks very much. I generally turned off the OIS on a tripod. I didn’t really get a chance to test with a TC, but the few shots I took indoors with it at my Fuji hands on showed a bit of softness wide open with the 1.4x, though still likely usable. There wasn’t really enough light to test it stopped down. Thanks for the review, Jordan. I trust your reviews. I am a former Columbus resident and have been friends with Stu and Jimmy since the CCG days. Just moved from Nikon D3s’s to Fuji, (wrist and back injuries were making shooting an exercise in pain!). I am looking forward to your review of the X-Pro2. 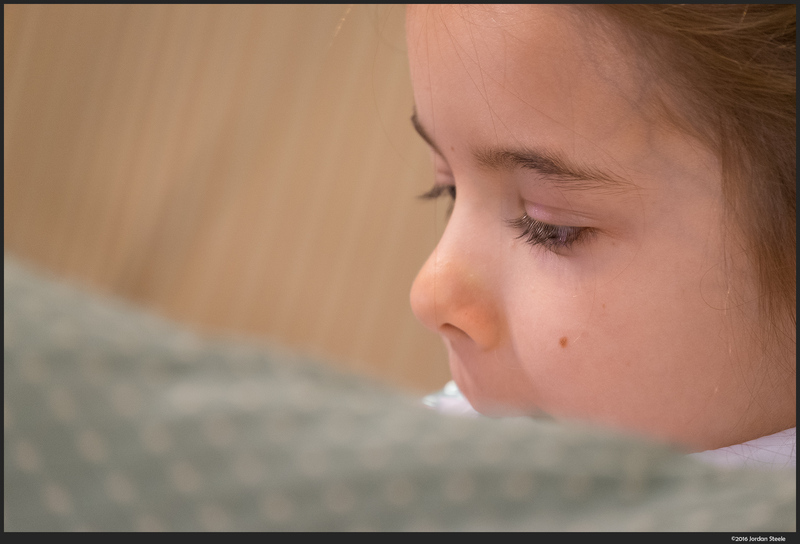 I have an X-T1 and an X-E1-don’t know that I care about the OVF, but everything else looks amazing! Hope to get to meet you on one of my pilgrimages to Midwest. Thanks for an interesting and useful write-up on this lens, as always. Unfortunately I had a copy that showed a weak left side and even weaker upper corner with smeary blur, that only got worse when adding the TC, so it is on its way back to the seller for a replacement. I can see the potential of this lens and really want one but just hope Fuji can assemble them reliably. I agree with your comments that the build is decent enough but a step down from the likes of the best primes and the 50-140. I too can understand the use of plastics to reduce the weight and retain some of the size/weight advantage that makes a CSC system so nice to handle. From the performance I saw at 400mm f5.6 in the centre and right side, I think the IQ should be very good indeed on a decent copy. With the TC, IQ did soften a bit but was very usable and improved clearly 1 stop down from max. I presume your copy seemed free of asymmetry or other issues in the optics? I also noted that mine had a few greasy smears and scuff marks on the body, plus more dust than I have seen before on a new lens, which seemed a bit sloppy. The condition of the packaging/bags suggested it had never been opened so came like that from the factory. Looking at the Fuji lens assembly video doing the rounds recently, it all looked like precision and clean-room standard in the factory, but I managed to package it cleaner in my study when I sent it back!! I love the Fuji system and have used it since the start, but was disappointed with this experience. Hopefully lens number 2 will make me feel better. As always good review, but so great great pictures. There´s no many review sites to do both of that. I own a Fuji XT1 as well as a Nikon D800. 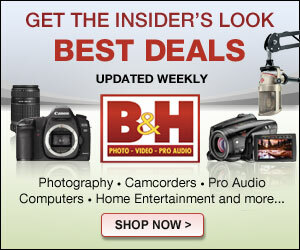 I am looking to buy a telephoto. I have owed the 50-140 but it didn’t give me the reach needed for my sons soccer games. I have identified this Fuji 100-400 as well as the Nikon 200-500 that might work for soccer games as well as taking architecture photos/Landscapes.. I understand the weight of the nikon is greater but optically, is the fuji superior than the nikon? are the images sharper? I have no experience with the Nikon , so I can’t really help here. Bagging the lens is easier if you dedicate a camera body to it, then use a Think Tank holster. V2 fits an XT-1 and this lens easily, and comfortably with a 1.4x attached. Thanks for the great review, Jordan. Which lens plate is pictured? It’s just a generic RRS plate. I can’t remember what lens it was originally specified for.